The Empathic Vendor is a food vendor that responds to two inputs: The voice of a norn requesting a specific type of food and a norn or the hand pressing one of its buttons. There are two different types of Empathic Vendors; one is quite large and built into the Norn Meso of the Docking Station, the other is a much smaller flower-like vendor which is portable. The large stationary Empathic vendor has three buttons for dispensing edible items of your choice; each activation releases either three Star Seeds, two Yarn Fruits or two Peaking Pies. 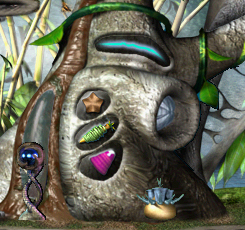 The portable Empathic Vendor, originally located in the Containment Chamber does not have any buttons, so it can only randomly release one of the three edibles when pushed. Both will provide a requested food type when a nearby creature expresses its desire for starch, protein or fat. Both vendors are standard issue for the Docking Station. When the blue voice line at the top of the large empathic vendor is turned on, all official vendors in Docking Station will vend food in response to creatures complaining about being hungry for starch/hungry for protein/hungry for fat. This is turned on by default in the game. Lemonade Vendor - an agent that attaches to the main empathic vendor. This page was last modified on 4 September 2018, at 17:01.